Less than a week after Queens Community Board 3 signed off on DOT’s PARK Smart pilot for Jackson Heights, New York’s neighborhood-level parking policy changes were given some national context on Wednesday at the National Association of City Transportation Officials’ “Designing Cities” conference. Given the Department of City Planning’s halfhearted attempts to reduce off-street parking requirements, NYC DOT’s changes to on-street parking prices are the boldest parking reform happening in the city right now. But the panel made clear that nationally, other cities have a leg up on New York when it comes to putting the right price on parking. New York is one of several cities across the country taking steps to reduce double-parking and wasteful cruising for scarce curbside spots by adjusting meter rates to align with demand. This type of curbside parking management can be a very effective tool to reduce congestion. In some New York neighborhoods, drivers cruising for parking constitute nearly half of all traffic. While NYC DOT has achieved measurable progress with PARK Smart in Park Slope, two California cities are out in front on curbside parking reform. San Francisco’s SFpark program and Los Angeles’s LA Express Park are perhaps the nation’s most advanced on-street parking management programs. Los Angeles also outfits enforcement agents with a tablet application that maps the location of every car occupying an unpaid parking space, allowing them to target enforcement. In Los Angeles and San Francisco, parking enforcement is performed by the transportation department; in New York it falls under the NYPD. 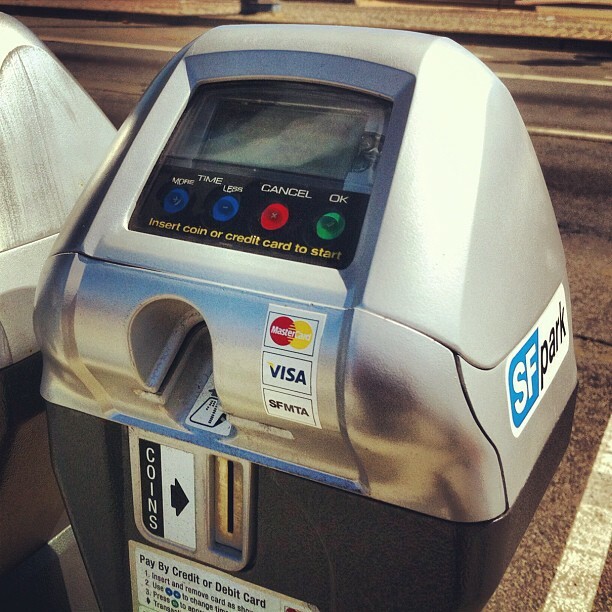 In San Francisco, the city government stopped offering free parking to its employees when SFpark went into effect and instead gave workers the option to either pay the same meter rates as the general public or buy a $1,000 permit for unlimited parking. “We wanted to put our own house in order and play by the same rules as everybody else,” said SFpark program manager Jay Primus. In New York, while City Hall has tried to cut the number of free parking placards issued to city employees, the total remains above 100,000. All those drivers with free parking perks can disrupt efforts like PARK Smart to put a more rational price on curbside spaces. SFpark, covering 7,000 parking spots (a quarter of the city’s metered spaces), also includes city-owned parking garages, where rates were cut significantly in order to compete with curbside spaces. Now garage parking is often less expensive than on-street parking — the reverse of what drivers find in New York. As a result, garage occupancy has increased in San Francisco from 35 to 55 percent full during the day, which indicates that more drivers may be heading straight to garages instead of clogging the streets in search of a cheap spot. A full evaluation of the SFpark program is planned for summer 2013. In many ways, New York, which is experimenting with sensors and is still planning a pay-by-phone pilot, is playing catch-up. “We’ve learned a lot from LA and San Francisco,” Schaller told his colleagues, before lowering his voice. “I hope you’ve learned a few things from us.” The statement was received with smiles from the California representatives. New York, with 80,000 metered spaces, is taking a slightly different approach to curbside parking reform than many other cities. Most significantly, New York is focusing its reforms on neighborhood commercial areas instead of the central business district. In some cities, additional revenue from higher parking prices is dedicated to streetscape improvements in the neighborhoods where the revenue is generated, in an effort to make the changes more appealing to local retailers and residents. None of the three cities on the panel do this. In New York, Schaller said, changes are enacted solely “based on the benefits of pricing itself” — specifically, increased parking availability and reduced congestion. DOT halted the Upper East Side PARK Smart pilot after Manhattan Community Board 8 voted against DOT’s request to expand the project area and raise parking rates in February 2011. DOT is in early talks to bring a PARK Smart pilot to the Atlantic Avenue business district in Brooklyn, and some residents and merchants near the Barclays Center have expressed support for bringing the program to their neighborhoods. If you raise on street prices and it doesn’t open up street spots (and off-street rates are still WAY higher), then you haven’t raised on street prices enough. Why is this hard to figure out? LA may be once of the cities ahead on parking reform, but we’re woefully behind on prioritizing pedestrians. Step off the curb too early in DTLA and a friendly LAPD officer while zip right over to write you a $175 ticket. @gowanusbker as tempting as it is to just jack up the rate, you can’t get reelected in this town by delivering $10/hr parking spots. What I don’t quite understand about these programs: Shouldn’t they be affected by induced demand problems? If congestion goes down and it becomes easier to find a parking spot, wouldn’t that incentivize more people to drive and thus cancel out any positive effects? It may be politically unpopular at first, but parking reform programs like SF PARK Smart has huge potential to change the way people drive and park. As it stands now in NYC, many shopping districts have simple munimeters along the commercial strips (still underpriced) and adjacent residential streets have no charge at all. Result? Non-stop double parking is epidemic. Plus, some enforcement of the double parking prohibition would raise revenue and make things much safer, especially for cyclists. Parking dysfunction in residential neighborhoods isn't caused by the lack of a permit system, it's caused by giving away finite curb space for free.